Coming across two different articles today, it seems as though excessive alcohol abuse is rampant in the United States but the doctors that are charged with taking care of the health of the America population aren’t necessarily asking the right questions that would decrease that destructive behavior. First, let’s be clear on something. Not everyone that drinks excessively or drinks too much is necessarily an alcoholic. Alcohol abuse and alcoholism are two different things. These people may be alcoholics. Or they may be just drinking too much. Many college kids binge drink or drink excessively, but not every college kid that does so is an alcoholic. However, some of them may be or may eventually become alcoholic. One of the differences between the two is that the binge drinker or the excessive drinker may realize the drinking has become a problem, make a decision to cut back, drink less or stop altogether and be able to do so. The alcoholic may make the same decision but either right away or after some time will be absolutely unable to stop or moderate. Eventually they will continue to drink alcoholically. This is always an important point to make when discussing alcohol abuse, because not everyone that abuses alcohol is an alcoholic. In Alcoholics Anonymous, they are often referred to as “heavy drinkers” or “problem drinkers”. These types of people may be drinking dangerously and need treatment or rehab, but still are not alcoholic. So the overall impact of this CDC report is the following: Way too many Americans have dangerous drinking habits, many of which could be curtailed by a simple conversation with a doctor, except that most doctors don’t have any type of discussions with their patients about the patient’s drinking habits. I mean, that doesn’t seem………good. Hopefully doctors will become more aware of the need to discuss the alcohol drinking habits with their patients. Hopefully this report from the CDC and other studies and some government or health organizations initiatives will get doctors more current on the issue. Hopefully people that may detect some issues with their own drinking will bring up the issue with their doctors in an open and honest way. Hopefully. Whatever the outcome turns out to be, it can be understood that by most standards there is an excessive about of dangerous alcohol consumption going on in America. Binge drinking. Excessive drinking. Hard drinking. Problem drinking. For some people engaging in this type of habitual drinking, a simple identification of the problem and a clinical intervention followed up by a practical plan of action will be enough to lessen the dangerous impact of the drinking. For many others, treatment will be necessary. For the most severe alcoholic cases, often the consequences can be dire. More often than not for alcoholics, detox and treatment are the first step (either inpatient or intensive outpatient substance abuse treatment) followed quickly by the introduction of Alcoholics Anonymous, including meetings of the fellowship where the person can quickly find a sponsor to help them take the Twelve Steps. 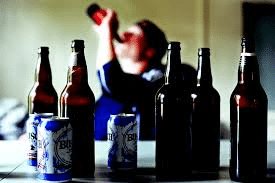 Whatever degree of dangerous drinking or excessive drinking or habitual drinking is taking place, there must be some form of help available to lessen or moderate or stop the drinking behavior. If you or a loved one is suffering from alcoholism or problems with alcohol or any other drug abuse or substance abuse issue, please call us at (410) 773-0500 or email Maryland Addiction Recovery Center at info@marylandaddictionrecovery.com so we can work with you to find the most appropriate help for you or your loved one. Visit www.marylandaddictionrecovery.comfor more information.